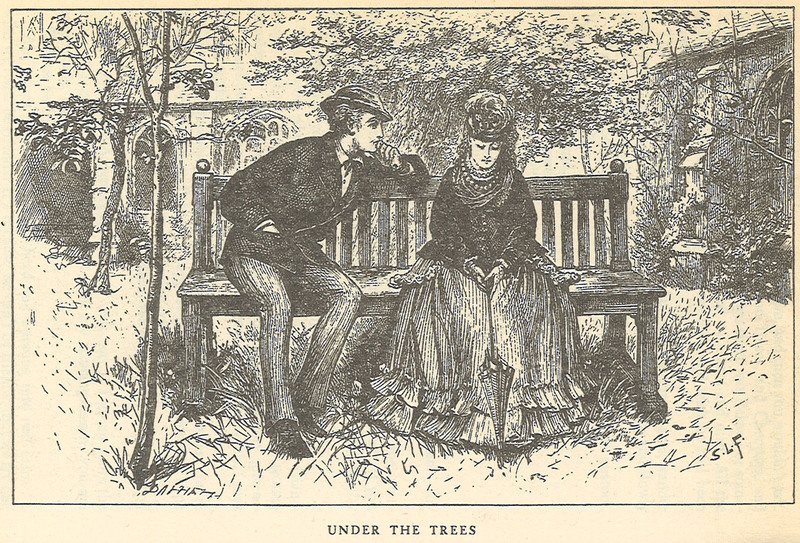 The first two chapters of Charles Dickens’ last novel introduced a few key characters. Aside from the title character, the most important was Drood’s young uncle, John “Jack” Jasper, choirmaster in the Cathedral town of Cloisterham. Edwin drops by to visit Rosa, his fiancée. She has had a marvelous birthday on the prior evening, but confesses she is tired of him. She also points out that he shows the same ennui. They go for a walk, and Rosa urges, “you shall pretend that you are engaged to somebody else, and I’ll pretend that I am not engaged to anybody, and then we shan’t quarrel.” Naturally they shall quarrel. They pass close to the Cathedral and hear the sounds of music. Edwin remarks that he can hear his uncle’s voice. All at once, as if in a panic, Rosa wishes to leave. In the next chapter, we meet “a credit to Cloisterham” or certainly a gentleman who thinks he is, Mr. Thomas Sapsea. His premises are in the high Street near the Nuns’ House. Jasper pays him a visit, saying, “I have for some time desired to know you.” Though he has not traveled, as an auctioneer, Mr. Sapsea knows objects and can look at them and correctly surmise their make and origin. But it about Mrs. Sapsea that Jasper has come to speak about. Mrs. Sapsea has been dead “three quarters of a year.” Her “monument having had full time to settle and dry” now awaits its inscription and occupant. The stonemason–“and a wonderful sot”–arrives to be given the epithet to be chiseled. “Durdles leads a hazy, gipsy sort of life, carrying his dinner about with him in a small bundle, and sitting on all manner of tombstones to dine.” Or perhaps drink. Mr. Sapsea gives Durdles the inscription and the key to the mausoleum. Jasper seems much interested in the key. In Chapter Five, Jasper has shadowed Durdles and discover an urchin throwing stones at the stonemason. Jasper remonstrates the boy, whose only name is given as Deputy, and offers to walk Durdles home. Along the way, trailed by Deputy, Jasper asks Durdles about the crypt. “As though he, Jasper, were getting imbues with a romantic interest in his weird life.” Jasper expresses interest in accompanying Durdles to see these odd nooks and secret places beneath the Cathedral. And thus the first part of The Mystery of Edwin Drood comes to a close. Chapters 1 through 5 first appeared in print in April 1970 as one installment of twelve planned. Of particular note, there are some curiosities in Chapter Three. Statements or comments that might be foreshadowing on Dickens’ part? Why is Rosa seemingly afraid of Drood’s uncle? Is Jasper premeditating the murder of his nephew? What’s his interest in Mrs. Sapsea’s tomb? Read along with The Poisoned Martini each week and examine the the origins of mysteries in the earliest examples of the genre. Next week, stop by for Chapters Six and Seven.